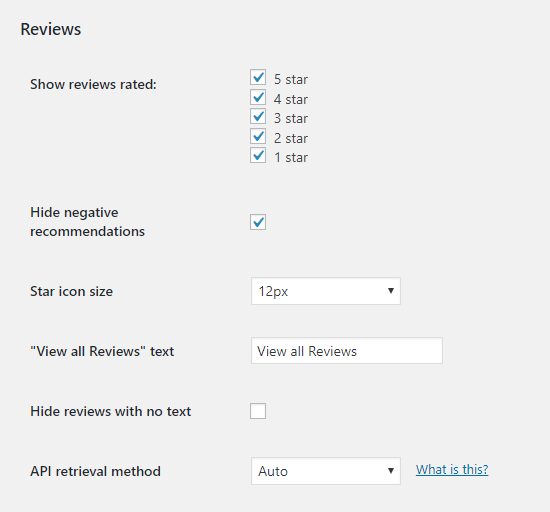 The Reviews extension allows you to display reviews from your Facebook Page on your WordPress site. Please note, you can only display reviews from a Facebook page that you are an admin of. Below is an example of using the Reviews extension to display Facebook Page reviews. See the How to use tab above for directions on how to use the extension. Upload and install the extension plugin zip file. Extensions are installed just like any other WordPress plugin. You can follow the same process used when uploading and installing the Custom Facebook Feed Pro plugin. Obtain an Access Token by clicking the “Log in and get my Access Token” button on the plugin’s Settings page and then after approving the plugin, select the Facebook page that you wish to display reviews from. Once you have your Access Token then copy and paste it into the “Reviews Access Token” field which is added to the plugin’s Settings page. 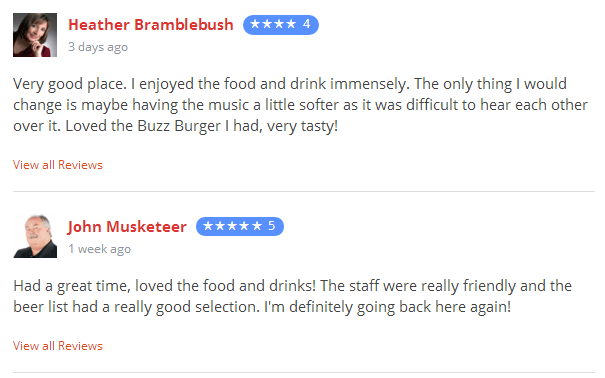 You can choose to display only reviews which have received a specific rating, change the size of the star icons, and edit the “View all Reviews” text. If you want to customize the general parts of the review posts (eg: background colors, text, links, etc) then you can do so by using the “Post Style” settings on the plugin’s “Customize” settings page. This will display a 5 star total rating. You can change the number of stars by editing the code. Be sure to copy and paste it into the “Text” tab of the page editor so that it’s rendered as HTML. Show reviews rated reviewsrated 1-5 Show reviews with these ratings reviewsrated="4,5"
“View all Reviews” text reviewslinktext Any text The text to use for the link reviewslinktext="See all"
* New: Added the ability to filter reviews by word/phrase. Just use the `filter` and `exfilter` shortcode settings. Please Note, this extension is an add-on and so requires the Custom Facebook Feed Pro WordPress Plugin in order to function.